Post-Pulwama, the BJP has managed to push battlefield ethics on to the electoral field, except that the special restraint applies only to the opposition. The sudden shift in the fortune of this general election after Pulwama is not just one of the regular twists and turns that elections go through. It is not just a clever late swing that Prime Minister Narendra Modi has managed to deliver more than once. It can only be described as a poll capture. Unlike the old-style booth capture, this one is neither local, nor crude as other attempts at election stealing are. This one seeks to capture the mindscape at a macro level. As the elections draw close, let’s be clear about one thing: we are not witnessing a poll campaign, instead we are in the middle of a full-throttled poll capture. Democratic system is being manipulated by seemingly democratic means in order to subvert democracy. Capturing this high-stakes low-choice election is only the first step towards a capture of the Indian state and what I have referred to earlier as the dismantling of the Indian republic. Understanding the mechanism of this capture and preventing it is nothing short of a patriotic duty. This poll capture has all the signs of a 21st century operation. It doesn’t deploy the crude muscle power of the booth-capturing days. Coercion, if at all, will be used through misuse of state power. Electoral manipulation does not need rigging the EVM. The BJP’s famed organisation machine, with latest management techniques to streamline millions of minions, will do much of its job. Money power, oodles of it, will be exercised via legitimate transfers through electoral bonds. Over the last five years, the media has already been recruited, bribed, coaxed, coerced and bullied into submission. A modern charismatic leader, a rabble-rouser who sidesteps demands of civility and chores of truth validation is here to preside over this capture. Despite all this background preparation, the BJP’s Mission 2019 had run into a difficulty: public opinion. Over the last one year, especially since December 2018, the regime’s popularity was on a steep decline. Not everyone agreed with me, but many political observers shared my sense that the ruling party was set to lose at least 100 seats and finish well below the minimum number required to have a go at government formation. Something big was needed to arrest this loss of narrative. That is exactly when the Pulwama terror attack happened. We know that the JeM owned responsibility for it, but we do not know what its motive was, besides striking terror into the hearts of people. What was the JeM, along with its Pakistani controllers, seeking to achieve by derailing this high-stakes election? But we do know that this unexpected development presented the regime with an opportunity to divert the attention from issues of farmers’ distress and job crisis. The game that the BJP has played since then is the following: use the vast means at its command to shift media attention to the issue of national security, deploy some facts, a lot of propaganda, some plain lies and spin doctoring to cement its ownership of this issue and then use aggressive organisational work, backed with astute management, to convert this into votes for the ruling party. 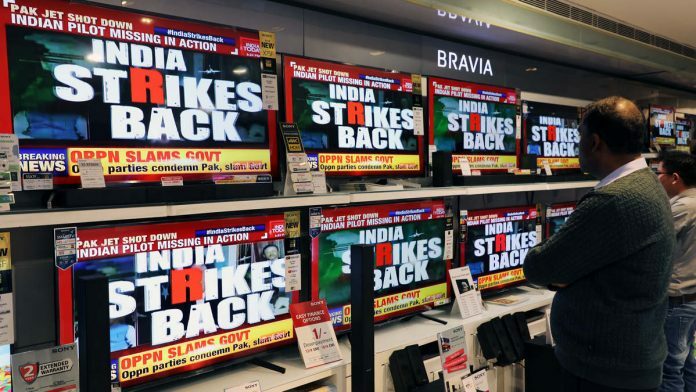 Post-Pulwama, the government and the ruling party’s control over the media has scaled new heights. National security concerns and near-war like conditions have induced willing submission and self-censorship besides an intensification of the strategy already in place: advertisements, arm-twisting of media owners, and vicious trolling of journalists who may not fall in line. Barring some, those sections of the media that were critical of the regime have been neutralised. Under these conditions, the BJP spin-doctors have managed a staggering leap of logic: to transfer the immunity from criticism of the armed forces to that of the ruling party. This has been achieved through a clever logical conflation. Under war-like conditions, national security issues demand deferred scrutiny and lower standards of proof. This privilege, of course, requires everyone to abide by the norms of national consensus: no one indulges in blame-game, no one takes partisan credit. The norms of electoral contestation, however, are altogether different. Here, every claim is up for unlimited scrutiny and merciless public criticism. Post-Pulwama, the BJP has managed to push battlefield ethics on to the electoral field, except that the special restraint applies only to the opposition. The PM can carry on with partisan and personal publicity for military action, while the opposition carries the onus of restraint. In the course of election campaign, the regime acquires the special privilege of taking credit without scrutiny. No one can play politics with national security except, of course, the ruling party! Over the next two months, we should expect a full blown, aggressive take-no-prisoners style of a campaign. We have already seen glimpses of it: election stage with photographs of deceased soldiers, rifles and aircraft on posters, politicians in military fatigues. More can be expected: full publicity blitz, intensification of the pressure on media and hounding of dissenting voices. The Election Commission may be pushed to look the other way on some critical matters. We cannot yet rule out another strike or some other action that keeps the focus firmly on external and internal threats to security. It is too early to speculate on what the final outcome of all this might be. At this stage, we are not looking at a 2014 kind of a wave that cuts across regions, classes and communities. It would be silly, for instance, to think that this political climate could change electoral outcome in Tamil Nadu or Andhra Pradesh. This poll capture is primarily aimed at the Hindi belt with secondary impact in the West and the East. The target is to swing anything between 2 to 5 per cent votes in favour of the BJP that would yield anything between 25 to 50 additional seats for the ruling coalition. That is what it needs to retain power. Those who are uneasy with the prospect of this capture must remember: we have no one except ourselves to blame for this. Half a century of ideological complacency, decades of institutional neglect and years of political lethargy have brought us to this state that allows democratic capture. Opposing and preventing this capture of power is the first and foremost duty, the apat-dharma (ethics of exigency), of those who believe in the idea of India. The author is the National President of Swaraj India. Why don’t you please petition the supreme court (SC) with all the arguments you present in this article? Lets see if the SC will annul or post-pone the elections per their wisdom. Thanks and I hope you’ll not take my comments as otherwise. I do respect your opinion but necessarily agree with your fearmongering. Does Mr Yadav smell a conspiracy there? If yes, it stinks. He was a productive ‘ideator’ but ends himself doing an opportunistic, poor, ‘sour grapes-type, commentary on Modi. I wish him rise up and realise that by crossing the border first time after 1971, Government has done something brave and is entitled for the credit – and the accompanying risk it entails. An apolitical and literate person like Mr Yadav complaining about “…. rigging the EVM”? Why not in Punjab and three three so-called ‘heartland states’ where BJP lost? I find this allegation repulsing as it seems to say that all three Election Commissioners and all the District Magistrates of all Indian districts have colluded against the opposition. This Yogendra Yadav is a good for nothing person. He neither works nor lets others work. Totally a waste, good for nothing fellow. Do some work and earn livelihood man. Yogendra says “What was the JeM, along with its Pakistani controllers, seeking to achieve by derailing this high-stakes election? But we do know that this unexpected development presented the regime with an opportunity to divert the attention from issues of farmers’ distress and job crisis.”. He has been trying to out something sinister, but doesn’t have the guts to. He even hinted the same during one of his interviews, but again didn’t have to guts to say it openly. At least this guy is better than Joker Arun, Joker Shathru, & Joker Yashwanth. These 3 are the most dangerous ones. They still haven’t forgiven Modi for not giving plump posts in the cabinet. It was as if they considered it their birth right. Such hatred they display for anything related to Modi & NDA. But the fact is Indian public is loving it. Modi performed as best as possible on all fronts under the Indian conditions, so he has a lot to run on. More importantly, Modi needs an emotional theme to bind the country together, beyond the usual divisive forces of caste, religion, language, etc. and national security is one such issue. So, it is fair game. Modi showed strong leadership and it is quite apt that he should run on it in the upcoming general election. I find the comments of Yogendra Yadav to be quite juvenile, he is being mischievous in his allegations. In a democracy, leaders do their job, publicize their work and run elections on them – as they should. Modi acted decisively on the national security front, so he has every right to run on it for the office. RJ, there is a difference between “strong” and “foolhardy”. Mr Modi’s decisions have been of the second kind. If they were strong decisions they would have resulted in improvement of our nation. Has economy improved? Has the morale of our farmers, youth, armed forces, teachers, students improved? Mr Modi has been an out and out disaster. Has fight against corruption improved? Is there even a murmur of any action against Panama Paper cases? For blatantly favouring Anil Ambani he has even thrown national security to the winds by DELAYING the procurement of Rafale jets. And that creature called corruption is now pointing a finger directly at Mr Modi himself, thanks to the talk of some 30000 crores given to a thoroughly incompetent man whose only qualification is that he has Mr Modi’s support. I beleive unless opposition is not coming with a better agenda than current government , there is no point is crying that Modi is hijacking the election. Opposition is just running on one agenda- “ Modi Hatao” and as long as there is no other narrative, PM can set the agenda and drive it. Pulwama has again given way to Rafale. If on 14 March the SC decides that yes, Rafale indeed needs a thorough investigation, then EVMs and VVPAT will again become of paramount importance. THEN, if post such a judgment the government goes in for strikes and whips up war hysteria, that will DECISIVELY go against the the BJP, because then it will become very clear to the common man that the Pakistan bogey is a creation of the BJP to cover up its myriad failures. 14 March verdict is very crucial. Till then Mr Modi can have sleepless nights.